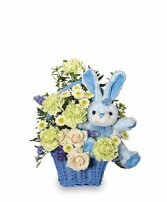 Tiny Blue Blessing Basket of Flowers in Presque Isle, ME - COOK FLORIST, INC. Looking for an eye-catching design with lots of color? 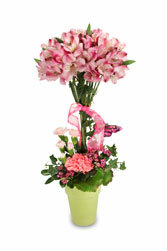 This topiary style bouquet of pretty pink alstroemeria with pink carnations is a must have! At Cook Florist, we have different plush animals, then the one featured here. 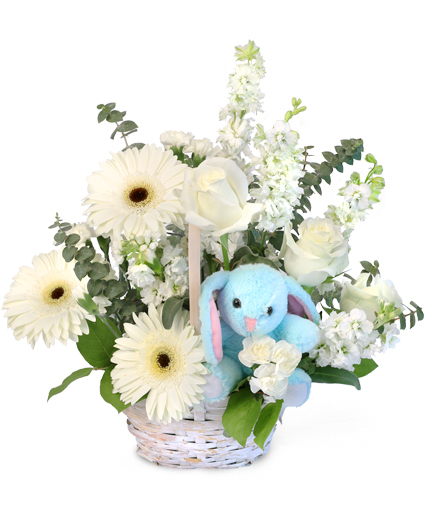 We will do an adorable bouquet for your newest member of your family. Please specify in special instructions if you do want blue & white colors only or we could use other popular combinations of colors.